One summer night during a severe thunderstorm a mother was tucking her small son into bed. She was about to turn the light off when he asked in a trembling voice, “Mommy, will you stay with me all night?” Smiling, the mother gave him a warm, reassuring hug and said tenderly, “I can’t dear. I have to sleep in Daddy’s room.” A long silence followed. At last it was broken by a shaky voice saying, “The big sissy!” Our culture has adopted the practice of applying feminine slurs on males who don’t live up to the masculine image of the day. Some slurs are more graphic than “sissy” but they refer to the same idea. I once had a discussion with a strong feminist who blamed that practice on the Bible. I couldn’t deny the fact that the scriptures do use the feminine gender to point to weakness. In Jeremiah 6:2, the prophet says, “The lovely and delicately bred I will destroy, the daughter of Zion.” As Ryken observes, “Jeremiah uses feminine vocabulary to show how vulnerable his people are. Previously he suggested that Jerusalem was preparing for battle by putting on makeup (4:30). Now he says Jerusalem is more like a maiden than a warrior.” One translation puts that verse like this: “I will destroy the Daughter of Zion, so beautiful and delicate” (6:2).” This is not a slur, it’s a contrast between beauty and brawn. In Jeremiah’s day, a shepherd was used to picture a leader who had many followers. It became the metaphor for strong kings who ruled nations and who were to be feared by their enemies. In Jeremiah 6:3 we read “Shepherds with their flocks shall come against her; they shall pitch their tents around her; they shall pasture each in his place.” To think of a shepherd as the image created in the Psalms and in the New Testament is to misunderstand Jeremiah. He’s comparing a young girl with a Mike Tyson male figure. 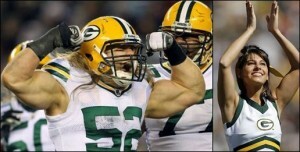 Maybe a better image would be a Green Bay Packer linebacker with one of the Green Bay Packer cheer leaders. Who would win in a physical battle of might between these two? It seems obvious. But it’s not a slur. The word sissy is used specifically to refer to the linebacker acting like the cheer leader when he’s in combat. You don’t bring beauty into a contest of brawn! The end is obvious! That’s exactly what Israel did in the face of their enemy. Jeremiah, or any of the human authors of the bible, did not demean women. The scriptures are full of women who surpass their male counterparts, Deborah being just one example. Anyone who watched the Republican Presidential debates this week should have been impressed with the courage, wisdom, and strength of the only female candidate on the block. Carly Fiorina showed herself stronger, smarter, and more courageous than many of the male candidates. Philip Graham Ryken, Jeremiah and Lamentations: From Sorrow to Hope, Preaching the Word (Wheaton, IL: Crossway Books, 2001), 96.